I spent part of today reading Flower reviews. Not to inform my buying decision, as I had already downloaded Flower from the PlayStation Network last weekend, and I'd played it to completion. I wanted to see what game reviewers thought about ThatGameCompany's follow up to Flow. When Flow arrived for the PS3 in early 2007, many reviewers didn't know what to think. Set in a surreal aquatic micro-ecosystem, Flow used the Sixaxis' motion controls to steer a tiny, luminous invertebrate through a series of simple evolutionary stages. It was quiet, lovely, and meditative. It didn't look or play like other games, and its lack of direction, story, or interface proved troublesome to many reviewers. One critic described Flow as "an attractive screen saver you can steer." Another said it was "Great for stoners" and argued that it didn't really deserve to be called a game. Though most critics praised Flow for its unique beauty and well-implemented controls, the general consensus seemed to be that it was little more than a tech demo or an interesting way to "veg out." At the risk of betraying my own pretentiousness, I'll admit I was disappointed that more reviewers didn't see Flow for what I still think it was: a lovely, almost perfectly realized piece of conceptual, interactive art. Flow's reception struck me as evidence that too many reviewers were unable to abandon their preconceived notions of what games could and should be. Would Flower suffer the same fate, I wondered? Would it be dismissed as yet another surreal, bite-sized advertisement for the PS3's technical capabilities? It certainly garnered a lot of oohs and aahs from those who'd taken it for prerelease trial runs, but then again, so did Flow. And as I'd already discovered, the two games have a great deal in common. They both employ incredibly simple gestural controls. They're both more suggestive than literal. And they're both almost completely devoid of traditional videogame themes and imagery. So where does Flower stand? It has only been a few days since its release, but the reviews I've read thus far have been extremely positive. The scores - for whatever they may be worth - are much higher for Flower than they were for its predecessor. More importantly, reviewers seem disinclined to dismiss Flower as another surreal geegaw. In fact, they're often eager apologists for the game's most unconventional attributes. Words like "euphoric" "and "fulfilling" abound. I'll jump in line with everyone else fawning over Flower. It's a magnificent game, and it deserves to end up on the hard drives of the vast majority of PS3 owners. Still, I was a bit surprised at first to see it find critical success in the wake of Flow's less-than-enthusiastic reception. It's possible that the steady stream of more conceptually-minded games since Flow's release have acclimated reviewers to unconventional experiences. Game critics might simply be more open-minded than they were a couple of years ago. Or maybe Flower, coming as it has on the heels of a holiday season packed with traditional games, arrived at just the right moment in the annual release cycle. There's probably some truth to both of those explanations, but they both ignore the fact that Flower is, in fact, far more conventional than it first appears. Flower's central mechanic of restoring light and color to formerly drab landscapes isn't a new idea. In fact, it's downright trendy nowadays, appearing in games like Okami, Twilight Princess, De Blob, and Prince of Persia. These restoration sequences, in which the player usually accesses new areas by "powering up" clumps of flowers, feel a lot like the sequences other games require to unlock new levels. Flower's late-game destruction events may involve streams of flower petals, but steering projectiles to smash through barriers isn't especially new to gamers, either. 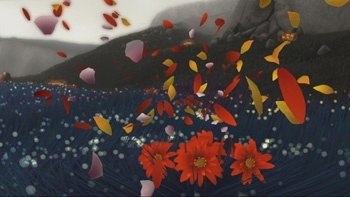 And in Flower, many of these activities occur as the player courses along in linear fashion, through connected chambers and tunneled landscapes reminiscent of games like Panzer Dragoon, Rez, and even the old Star Wars arcade game. Flow subtley echoed older games, like Asteroids and other 2D shooters, at least on some level, but it didn't provide the exhilarating sense of speed and acceleration of modern games, as Flower does. There were no dramatic explosions or moments of destruction in Flow. You didn't get to feel fast, powerful, and important. Flower, in contrast, provides all of these sensations, even if its protagonist is a swirling column of plant parts. It's unsurprising that reviewers are much more inclined to embrace a game that repackages familiar experiences, especially when it repackages them as skillfully and beautifully as Flower does. Flower shouldn't be faulted for its conventional attributes. In terms of sheer exhilaration and emotional depth, most games don't even come close to providing such singular experiences. The fact that it builds on time-tested game attributes isn't disappointing. It's encouraging. Flower shows us that even conventional games can aspire to much greater heights - something I hope game developers will keep in mind.